Father’s Day and a birthday are two perfect reasons for a diner, I thought. So, I surprised my dad with a visit to one of the most fashionable restaurants of Ghent, Volta (www.volta-Gent.be). I once went to Volta a couple of months ago. Then I tried the full five course menu. Now I just went for lunch. Volta has a special lunch menu. They offers 4 “snakxx” and a main dish for just 24 euro. Compared to other restaurants and their sometimes dubious level of quality, Volta’s menu is cheap. We both ordered the lunch menu. As the main dish was fish, we asked for a white wine, called DeMorgenzon (the Morning Sun). It’s a delicious white wine from South Africa. DeMorgenzon was named like this because it is the first part of the Stellenboschkloof valley to see the sun because of its high altitude and aspects. (more information about the wine: DeMorgenzon). On the table we had some bread and a homemade butter with grains, seeds and red pepper, which we really liked. I’ll try to make it. Our four “snakxx”: Ratatouille of zucchini and tomato // lentils, cucumber and dill // salad of pork shoulder, bitter herbs and pickle // soft cheese ice cream, cauliflower and radish. I personally preferred the last two, although the other dishes were also good. I didn’t have time to take a picture of the lentils dish. The fourth pictures you see is something I will talk about later in this post. The main dish was North Sea Plaice with sand root and young chervil. Just carrot, you would think? Yes, indeed just carrot, but delicious carrot, cooked “al dente”. 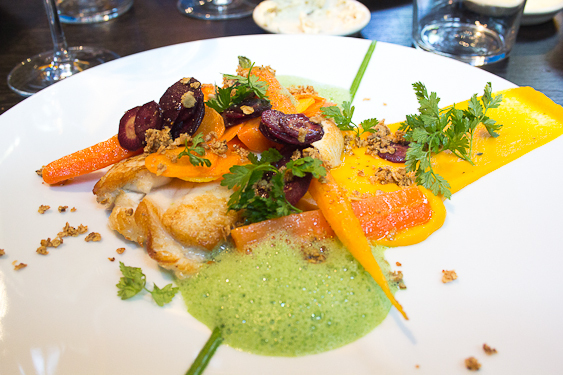 The fish was amazing, just like the chervil foam. It was just a perfect combination (first picture). This dish really blew our mind. As you may know, I am organising a whisky and food tasting next Saturday together with Mattias Camps and the Bonding Dram. 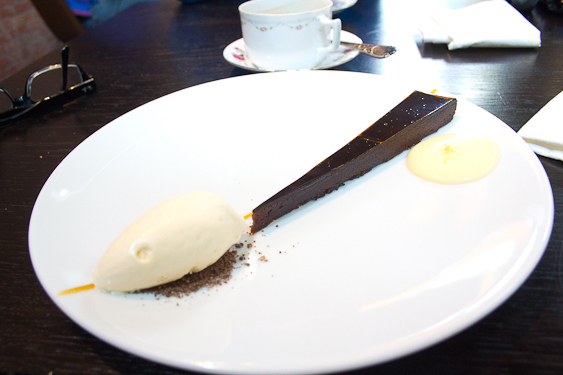 One of the Volta desserts was a Ghana chocolat pie with lemon cream, coffee crumble and Jack Daniels Ice Cream. I had to taste this of course. Just one word: Delicious! We finished with a coffee and…the two little chocolats. You can see them on the second picture. The white chocolats were filled with a liquid filling of pear and orange. You had to put it in one time in your mouth because it was so liquid. The taste was incredible. Such a small chocolat, but such an explosive taste. 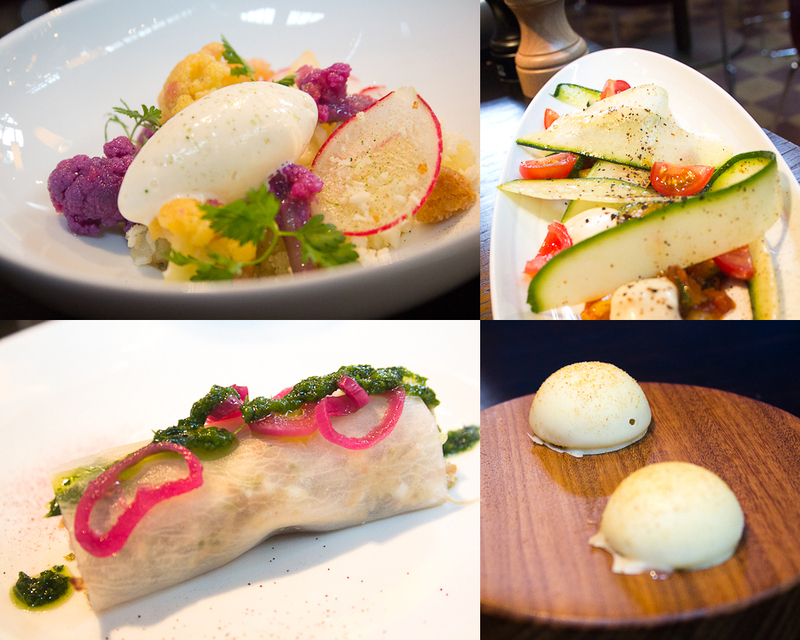 I hope that Olly Ceulenaere of the Flemish Foodies keeps on making these kind of dishes. Then I’ll come back for sure.